Of all the tasks involved in starting a blog, choosing a wordpress theme is the most fun. Usually, until it gets overwhelming! Many new bloggers find themselves spending the first few weeks of their blogging life switching themes and still not having the exact look and feel not to talk about functionality they want. With my first blog, I used 5 themes before giving up on changing themes! (Truth: It’s waaaaaay more than that number). With this post, I aim to eliminate that overwhelm. Read on to learn how to actually choose a theme that you’ll not just love, but that will showcase you and your work in the best way possible. I’ve also included the 10 best feminine wordpress themes for different purposes. 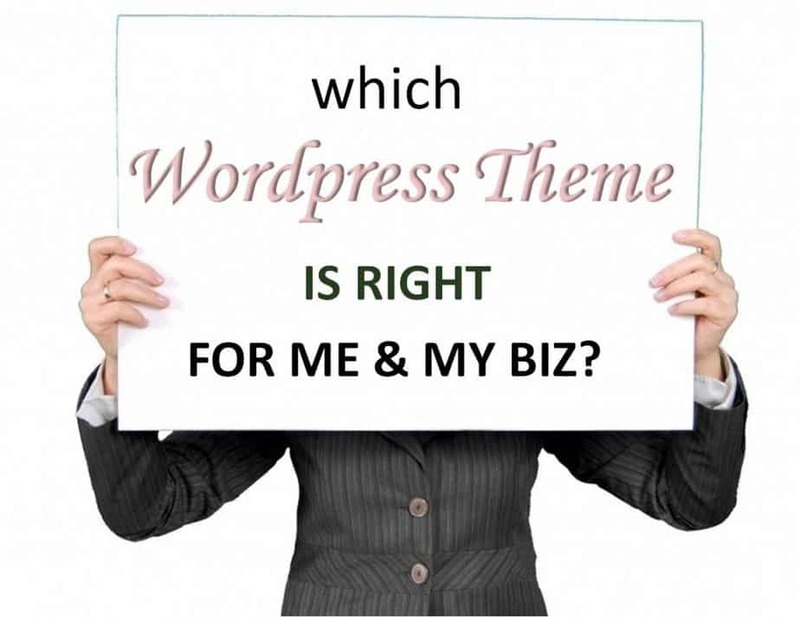 Paid or Free WordPress Themes: Which to Use? Choosing a theme may seem pretty straightforward but there’s a lot of thought that should go into getting the ideal one. Like with starting a blog and choosing a niche, the blog theme you use should depend on what you plan to do with your blog. You’ll find that it’s easier to run a blog with a theme that not just satisfies your aesthetic tastes but showcases your business in the best way. So while it may be tempting to look for the prettiest of the pretty feminine wordpress themes available, here are some questions you should definitely ask before you buy! #1 Is it mobile responsive? More than pretty designs, you need responsive wordpress themes. The majority of internet users access blogs and websites from their phones so if the theme you’ve chosen doesn’t work so well on mobile, you might as well forget about it. This is possibly the most important factor. #2 What is the purpose of your blog? Do you have products to sell? Do you want to drive traffic to an online store? Do you want to showcase your services or your work? Whatever you want to do, there’s a different theme for it. 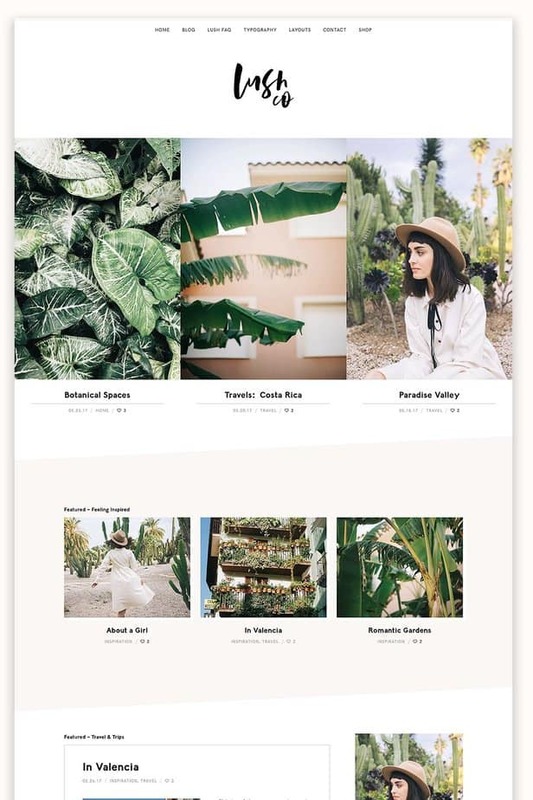 The lifestyle blog theme your friend uses for example won’t necessarily make for a good feminine wordpress theme for photographers if you are one. Do the tools you use to showcase your work integrate seamlessly with the theme you plan to purchase? #3 What is most important to you? Getting people on your list? Showcasing blog posts, videos, or photos? Getting the most ad revenue? The theme you choose and its layout has to serve your need! #4 How tech savvy are you? If you are tech savvy and know a bit of CSS code, you could easily alter some elements of a theme to be exactly what you want but if you aren’t, best stick with themes that ALREADY LOOK exactly as you want. #5 What is the quality behind it? From the quality of the designer, to the number of themes the store has, to the number of people already using it. Chances are you will need support somewhere down the line and it’s easier to get it when there are others who have experience with your theme. Another thing to worry about is how often the theme is updated, this is usually an indication of attention to security. Quick Tip: When choosing a theme, look past the feminine fonts, pretty pictures and even the feminine colors. Those can be changed up. What can’t be changed without great effort for the most part is the layout Look at the blog design of other sites doing what you intend to do and go theme hunting with a picture in mind. Cool trick: Find the wp themes used by your favorite bloggers with IsItWP. Just plug in their dot com and you’ll get the theme, plugins and even the host name! If you love to tweak things, know a bit about security and have the time, you could very well build a gorgeous website with a free theme. My favorite is Astra because it’s extremely customizable and because they use their free themes as bait to get you to buy, they are frequently updated. 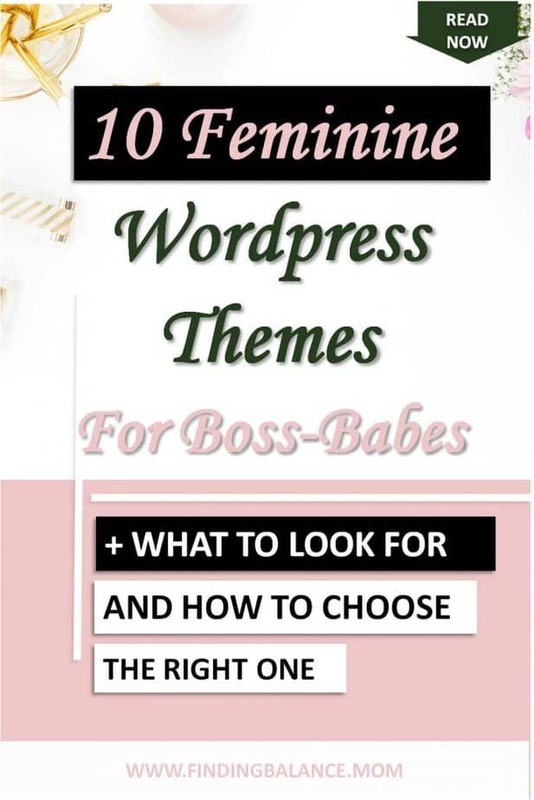 These are my top feminine wordpress themes in no particular order. 1. Victoria – The premium wordpress theme for badass female creators and infopreneurs. I know I said this was in no particular order but I’ll be damned if Victoria didn’t take that first spot. 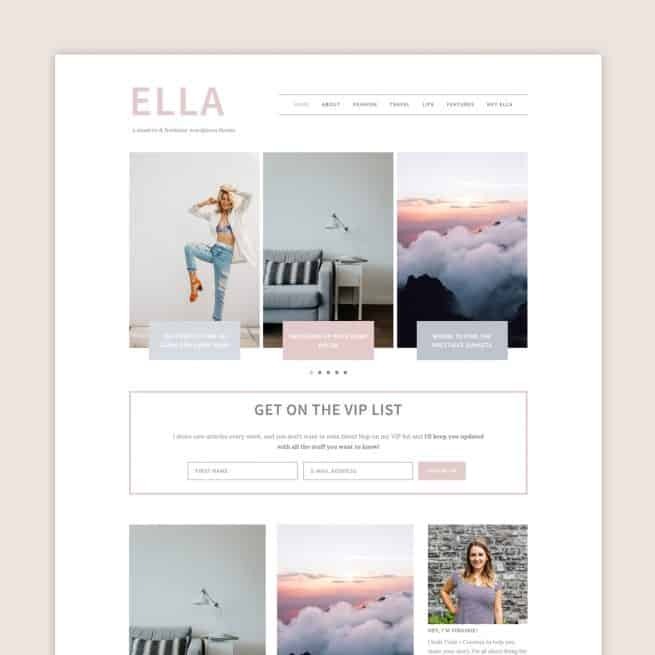 Elegant and WooCommerce ready, Victoria is the ultimate wordpress theme for bloggers, coaches, and just about any girl boss! Victoria lets you convert your audience when you still have their attention with a hero image above the fold and a call to action button you can completely customize to show up on every page like Melyssa Griffin does, or just on your homepage. View Victoria and learn more. Samantha is a favorite with shop owners. 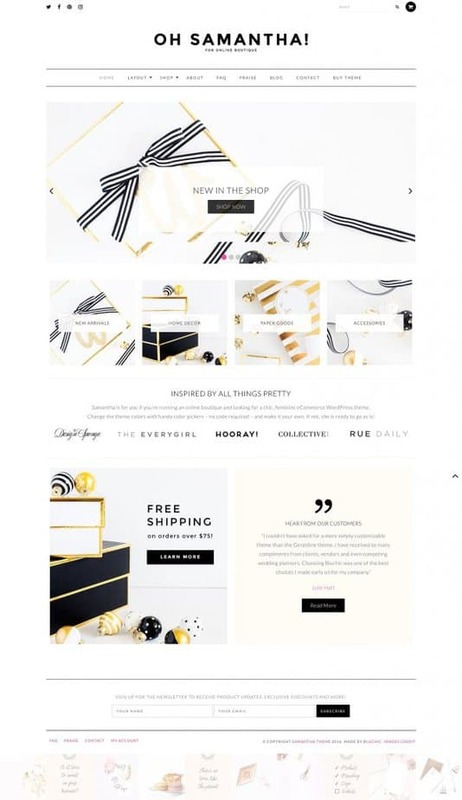 A minimalist ecommerce wordpress theme perfect for shops, boutiques. and even digital stores. Bluchic themes are coded with SEO and conversion in mind and Samantha is no different. It has a blank template for landing pages and its newsletter signup form allows you to build your list easily. View Samantha and learn more. 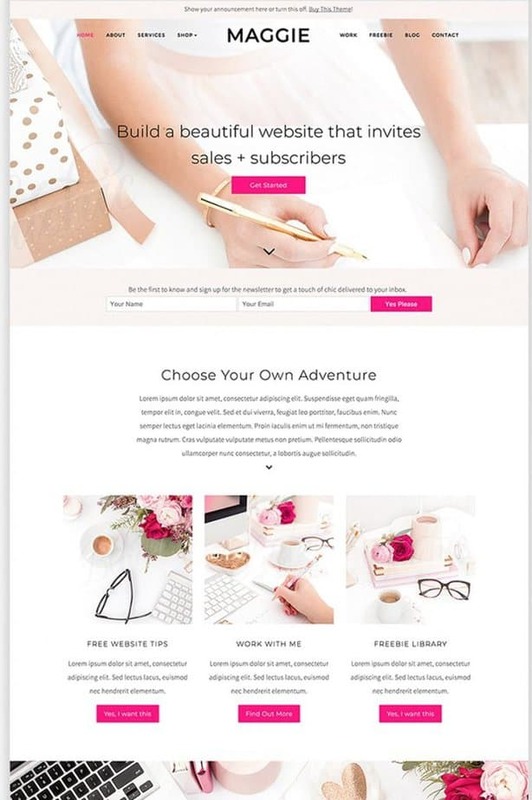 Vigirnie, a female entrepreneur herself, and her team at Code & Coconut made this chic wordpress theme to be without bloat or a learning curve. Many wordpress blog themes come with just too many features that weigh them down and make you site slow. Virginie builds her themes on the Genesis Framework, fast reliable and secure. 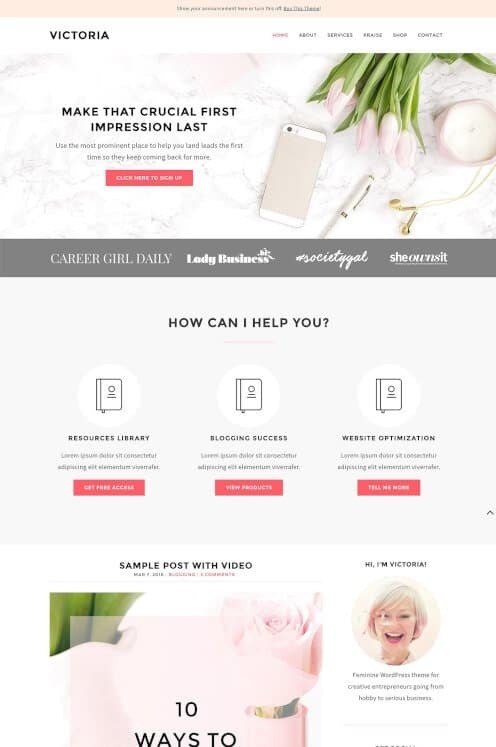 From what her customers say, this simple feminine wordpress theme is going to be the easiest install you’ve experienced. For you Instagram lovers, you get to display your feed in the footer! View Ella and learn more. Maggie is the newest wordpress theme in the Bluchic Store. If you are looking for something daring, powerful and refreshingly different, Maggie is your girl. Like most Bluchic themes, it’s WooCommerce ready so you can get an online shop up and running in no time. Maggie is also perfect for consultants, coaches, freelancers, even bloggers! It’s a very versatile theme. Giving that Maggie came immediately after Victoria, it inherits all of its awesomeness plus some. There’s the hero image and above the fold call to action, then there’s class, testimonials and sass! View Maggie and learn more. She’s clean, she’s bright, she’s chic! Adelle allows you to add your signature at the end of your post so if you’ve always wanted to sign off your blog posts on a personal note, this is the theme for you. Like ella, this is coded on the Genesis framework. View Adelle and learn more. Anissa means grace and this theme is nothing short of graceful. The elegant typography and post styling, and a featured post carousel! 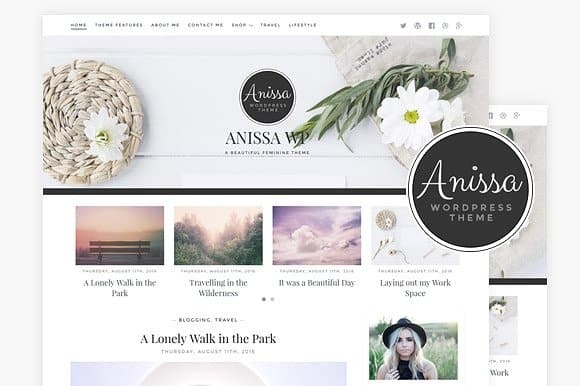 Having used Anissa myself before, I can vouch for the speed and responsiveness of this wordpress theme. It also has a custom about me widget where you can add a photo and your social media links, and also has a social media menu in the header and light-weight social sharing buttons built-in to each post. View Anissa and learn more. You’ll hardly see a favorite theme roundup that doesn’t include Creative. With 5 layout options, a fun custom header design and color palette, this fully responsive wordpress theme is an easy choice for most people. You can choose to display the full width homepage or show a sibebar. Creative is also Woocommerce ready so get ready to start selling! View Creative and learn more. The Exposure theme just takes my breath away. It feels so real, so alive, so EXPOSED. No better way to make your photos come to life. Exposure has this great feature that auto-installs the demo content making the theme look exactly like the one you see on the Live Demo AKA ‘one click install’ . It works with a visual page builder that let’s your website come to life before your very eyes and you can easily start selling using WooCommerce immediately! View Exposure and learn more. Lush is a bold, stylish and feminine WordPress theme built on the Genesis Framework. It features a Heart This button on posts and is woocommerce ready. Lush’s pages allow you to use a large hero image to highlight your main point and to display blog posts in grids. Sticky navigation bar, full-width Instagram footer section and lots of other cool features. View Lush and learn more. 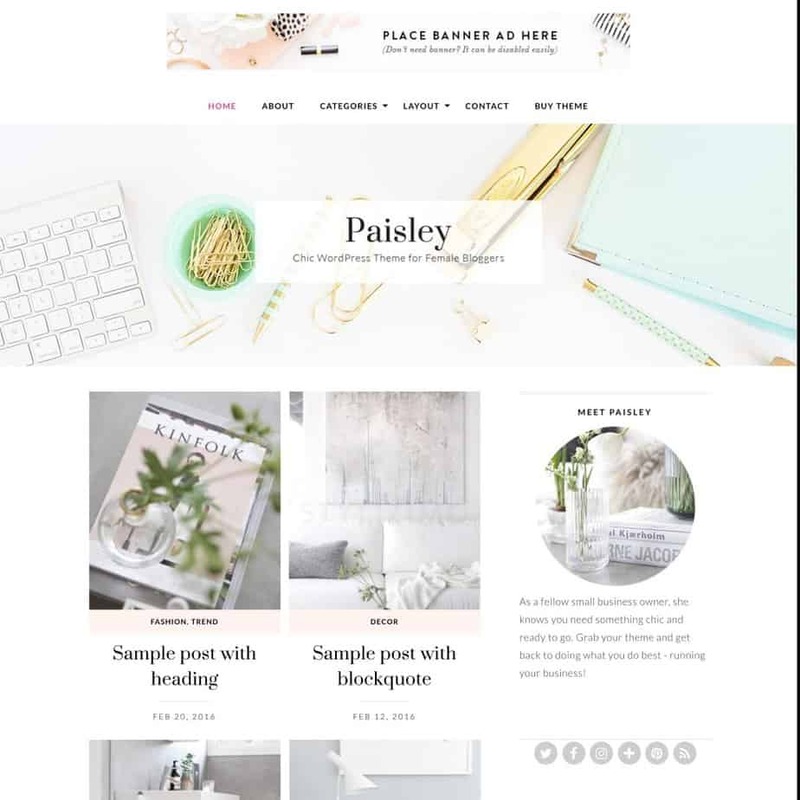 This feminine wordPress theme for bloggers comes with a classic chic style that allows you to display your blog posts in two columns in a grid layout and allows you to make a bold first impression. Paisley is Banner Ad ready and has a blank template for landing pages. View Paisley and learn more. Bluchic is hands down my favorite girly themes store. 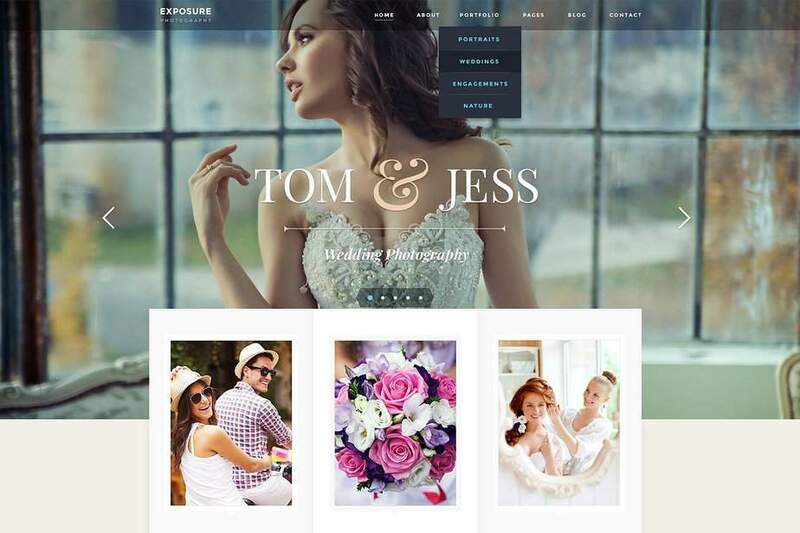 They create premium wordpress themes that don’t sacrifice functionality for cute designs. It was really hard to decide which Bluchic themes to leave in here and which to remove… All they make is feminine themes for wordpress! One thing I really love about them is that their themes are conversion focused so if building a list is important to you, Bluchic themes are really great for it. They are constantly adding new themes which tells me that they care about their brand + Kathie is a really nice person and replies to my emails herself! But Bluchic themes cost around $79 so if you don’t have a big budget, Code and Coconut has some great looking yet cheap feminine wordpress themes (they run on the genesis framework though). More still? You can find loads of beautiful wordpress themes on Creative Market. The feminine wordpress themes on there are also available for almost any budget. Was this post helpful? I’ll be stoked if you shared it with your friends, thanks! Helpful in choosing word press theme. Good write up with appropriate images attached for better understandings. Appreciate your work Thanks for sharing. 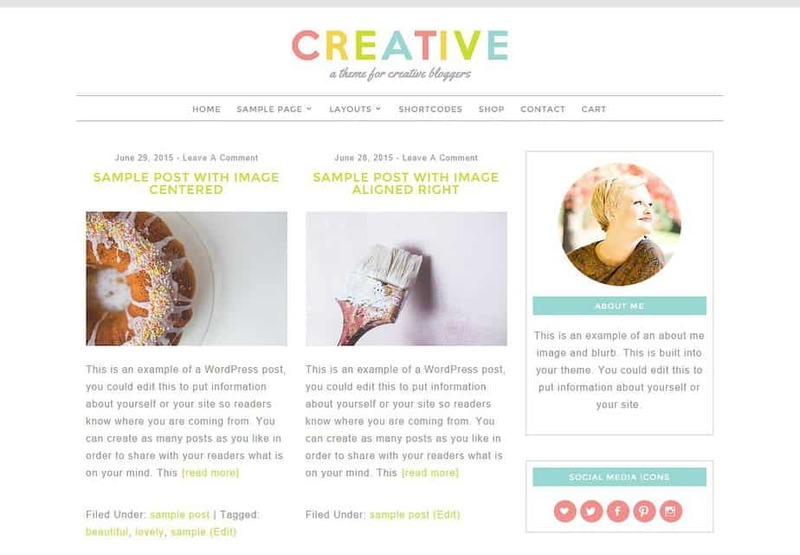 Which wordpress theme did you like best?